Two theatre performances took the stage this weekend- one transporting audiences to England at the turn of the nineteenth century into the twentieth, another with a giant, human-eating plant. 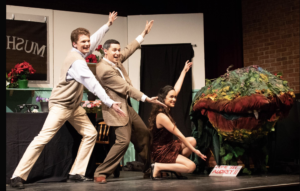 Vanderbilt University Theatre’s Mrs. Warren’s Profession and Vanderbilt Off-Broadway’s Little Shop of Horrors both debuted last week, featuring an array of first-year students heading up their casts and crews. A mother and daughter come to terms with their divergent pasts in this 1893 drama by George Bernard Shaw. 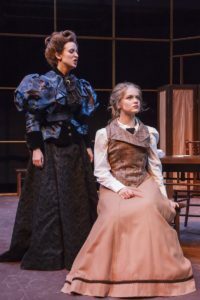 The play centers around Vivie Warren, an ambitious university graduate played by first-year student Mary Marguerite Hall, coming to terms with her mother’s promiscuous career. Fellow first-year Ian Guile played Frank Gardner, Vivie’s love interest, and first-year Barton Christmas played Reverend Gardner, Frank’s (and possibly Vivie’s) father. From the tangle of this complicated family dynamic emerges a social commentary on the role of women in society and their lack of meaningful employment opportunities in Victorian England. “After intermission, the show really goes into some powerful statements about feminism and how women interact with men in a transactional sense,” Christmas said. Walking into auditions on a wim, he wound up joining two other first-years in their VUT debuts, as well as three upperclassmen who lent their experience to the cast of the final show directed by longtime Vanderbilt Theatre professor Terryl Hallquist, who is retiring after this year. “First semester I remember sitting, biting my nails and watching theatre happen on campus, thinking ‘I want to do it… it looks so cool!’” Christmas said. Blending comedy, drama, and deep themes to ponder, the play began with a musical pre-show, where the performers sang a medley of songs while they donned their costumes. The sequence of the songs moved backward through different time periods, all pertaining to the ideas presented in the show. Fame and success can have a deadly price, as the characters in Little Shop of Horrors learn. First-year David Ward played Seymour Krelborn, an awkward but innovative teen who comes up with the idea to display an exotic plant in his flower shop’s window to attract business. Seymour falls in love with fellow shop employee Audrey, played by first-year Adreanna Hernandez. At the beginning of the show, Audrey is dating Orin Scrivello, D.D.S., a crazed dentist with a passion for inflicting pain, played by first-year Foster Swartz. The run-down neighborhood of “Skid Row” is populated with residents like the one played by first-year Sabrina Kaplin, who also served as an understudy for the other female roles. Seymour’s business scheme works, but with a catch: his famous plant only eats human blood. As the musical rockets through rock ‘n roll songs, heartwarming ballads, and sometimes gruesome plot twists, the audience is entertained by the absurdity of this attempt at success gone horribly wrong. After coming back from spring break with lines and lyrics memorized, the cast, musical performers, and crew, which also included several first-years students lending their skills to the project, worked to create an environment where dark humor and young love combine to form an artistic and entertaining show.